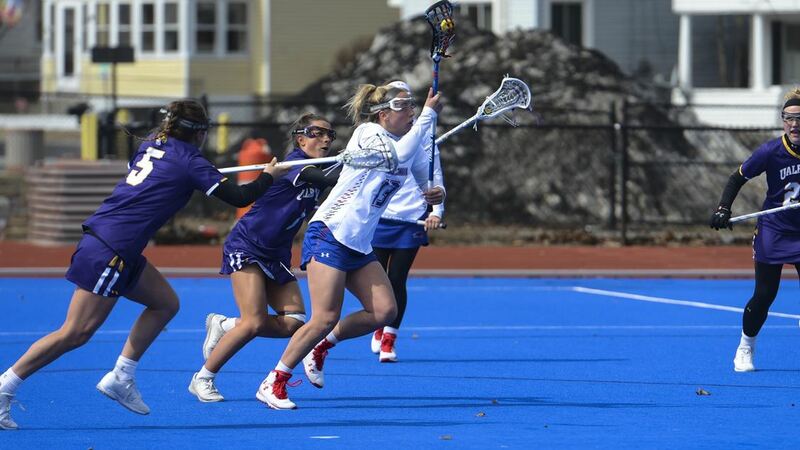 Two exciting comebacks made by UMass Lowell’s women’s lacrosse team ended in a disappointing 16-10 loss against the UAlbany Great Danes on Saturday afternoon. Wicked Blue made quite the battlefield for the two aggressive America East teams as they grinded to the result. The loss is UMass Lowell’s third in a row and brings their overall record to 3-7 as they finish up their second month of play. But hardly felt like one to UMass Lowell players, coaching staff and fans alike. “I am first and foremost extremely proud of my team,” said head coach Carissa Medeiros. She said that she told the team to forget about the successes and hardships they had faced in the first part of the season and to focus only on what they could do today. To make a statement to the rest of the conference that UMass Lowel would not go gentle into that good night, as the poet Dylan Thomas might say. Her squad brought intensity and resiliency to the field in the face of impending doom. UMass Lowell faced a daunting 5-1 deficit ten minutes into the first half, and it seemed as though that might have been the death knell for the River Hawks. They ended the half trailing UAlbany by one, having scored four straight goals, three of those coming on the free position. In the second half, UAlbany gained a leg up and led UMass Lowell by three goals just a little over ten minutes in. Just seven minutes later, UMass Lowell took the lead after scoring four straight, the first time that they have ever had a lead against the Great Danes. Even as UAlbany snapped back into their game and scored goal after goal, up until they gained a four-goal lead with just under two minutes left in regulation it felt like anyone’s game. Despite the tough end result, it was a big day for the River Hawks. Junior attack Cameron McKelvin earned a hat trick and senior midfielder Kendyl Finelli became UMass Lowell’s all-time leading scorer after tallying a goal and an assist. She now stands at 111 career points with the season far from over. She says that she cannot quite believe it. she chose to attend UMass Lowell with a newly-crowned Division I program was not lost on Medeiros. In addition to the milestone for Finelli, the River Hawks had a big afternoon on the free position. Five out of their 10 goals were scored on the free position, which Medeiros said came out of a serious effort in the team’s practices this season. When considering all of the intangibles, both Medeiros and Finelli have optimistic feelings about the rest of this season. Finelli said that she believes that the River Hawks could give any team in their conference a good game and maybe beat them too. Even if the beginning of the season has been rocky, she says that there is a deep connection between every single player on the team and they have what it takes to win. The River Hawks will travel to Stony Brook for a 1 p.m. tilt on Saturday, Mar. 20. They will return to Lowell to play another conference game against the University of New Hampshire on Wednesday, Apr. 3 at 4 p.m.